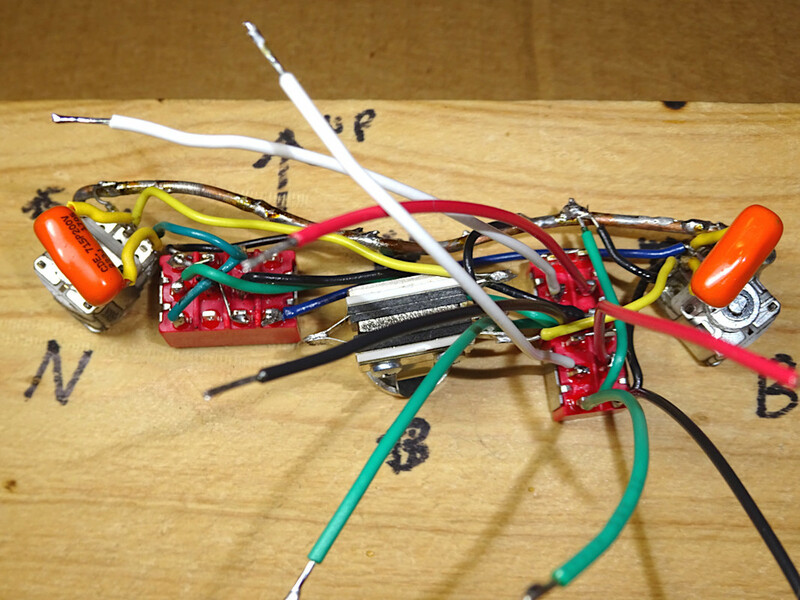 For important info about soldering, see the corresponding Step 8 in "Al King tone". The "helping hands" are large alligator-clips grasping the base of a switch's threaded bushing. I thought this might "sink" the heat out of the switch (help it cool between tinning lugs). I also used some flat alligator clips on adjacent lugs (as heat sinks). I tinned a lug, waited 6-8 seconds for the solder to cool, then moved a clip to that lug. (Don't blow on the solder to help it cool. That can create bad joints.). Then I tinned a pigtail (then another lug—on the other switch). I was afraid tinning the lugs too quickly might cause heat to accumulate. 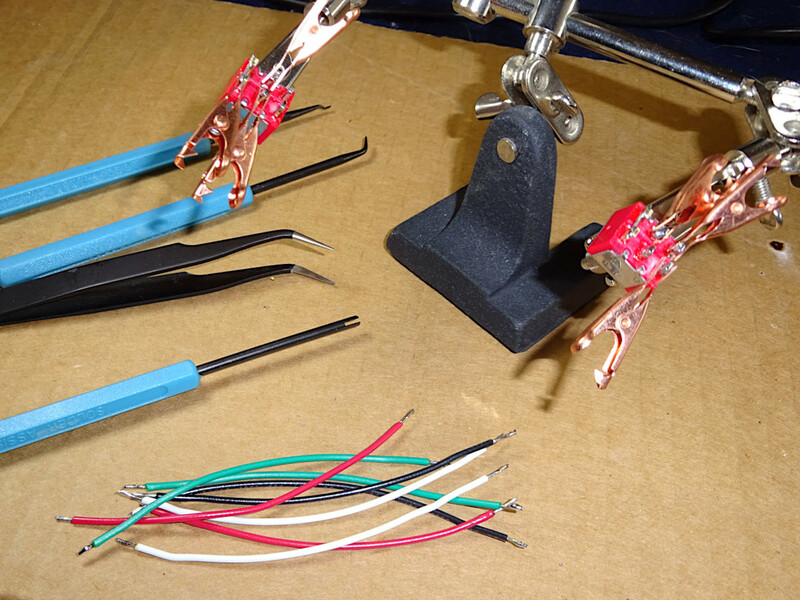 That photo also shows some of the tools which came with my inexpensive soldering iron. 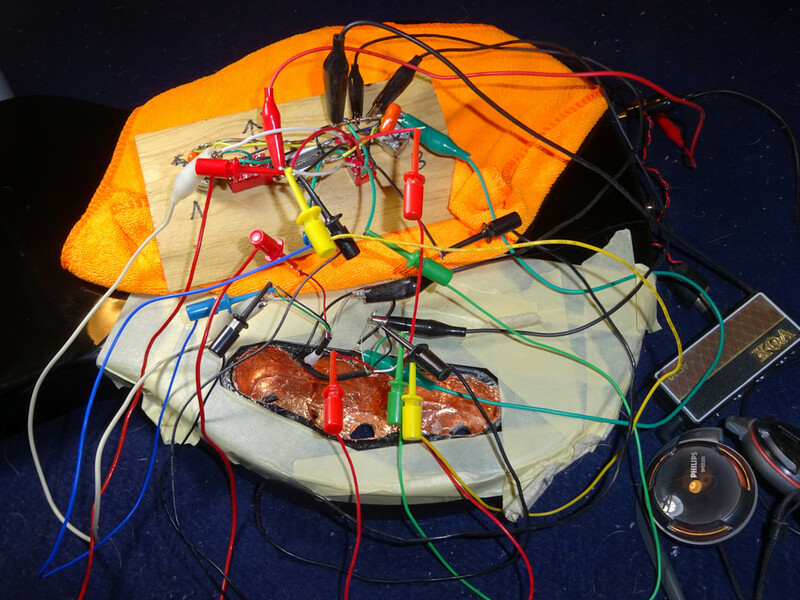 Those are handy to hold wires against the solder joint, and fish wires through the harness. I give more details about that iron (and flat alligator clips) in the dual-concentric mod's 3rd post. I guessed at how long the pigtails need to be. I cut them 3-1/2" (8.9cm) long. I tinned both ends. (If you strip them, you should tin too. The stranded ends will fray, snag, bend, weaken.). I'm embarrassed to share so many photos showing my soldering. I'm sure many (all?) joints are bad. But, so far it works. There were a few joints I wanted to redo. But, I feel like the less handling, the better. I think I'd do more harm than good if I obsessed about this. That required 13 jumpers. (If it didn't work, it would have been frustrating. But, not as frustrating as if I installed it—then had to remove it.). I installed the jackplate first. (Hint: If you remove your jackplate, you should pay attention to how the jack is oriented in the hole. I've had some problems with that. For more information, see my dual-concentric mod, Post #1, section 2 (shielding).). I rested the harness halfway into the cavity. From there I soldered the jack's hot & ground wires (red & black wires twisted together). I also soldered the ground wire coming from the bridge's bushing. 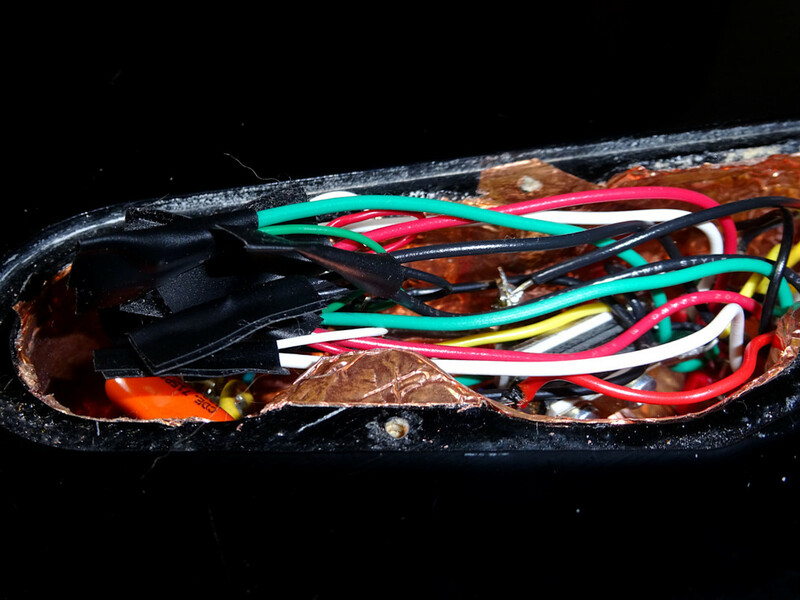 There are also two bare ground wires from the pickups. I soldered a 3-1/2" pigtail to the ground bus for them. (I plan to remove my pickups again; replace the ceramic magnets with Alnico, more tone experimentation. I don't want to have to remove this harness just to be able to fool around with my pickups.). 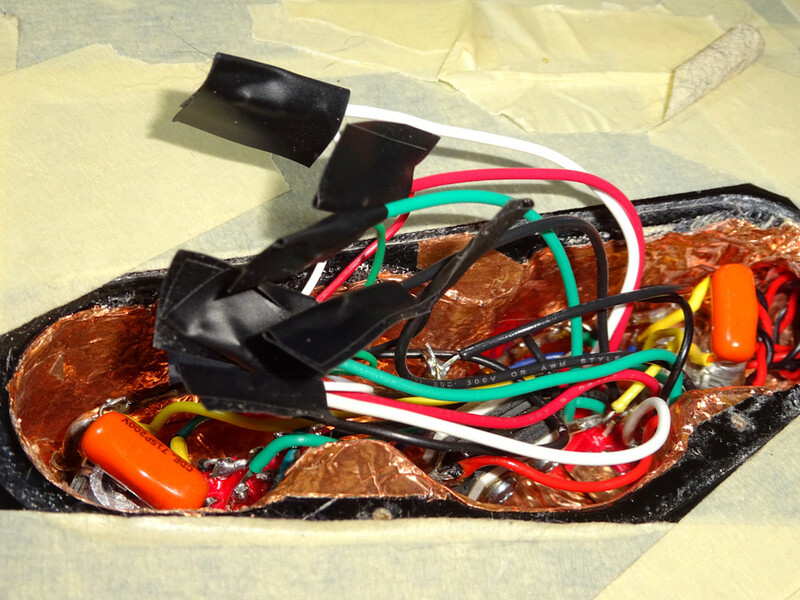 With only the four pickup wires to solder (times 2), I fully inserted the harness. This was very challenging. It's best to insert the bridge's switch first, then the neck's switch. Or, stagger them sideways. (It would be beneficial to grind more off the top of that bulge, so the switches have a better chance clearing it together). Be patient, take your time, use a couple small (jeweler) screwdrivers to guide things into position. Warning: If you recall from the diagram, the bridge pickup's hot/black wire goes to the bridge's coil switch, then to the bridge's volume pot. I cut that (switch to pot) wire to a perfect length (mounted in the jig). The problem was: when installing the harness I needed to move the bridge switch independent of it's final position. That wire caused me to struggle getting the two switches installed. Next time, I would leave slack in that wire. Perhaps twice as long as necessary for mounting in the jig. Note: At the end of the "Al King tone" mod, I felt that my 3-way pickup selector extended too far above the dress ring. I believe that was because 1) I replaced my faceplate (the original was about 2x thicker.). And, 2) my Special-II came with a thin washer between the dress ring & faceplate. 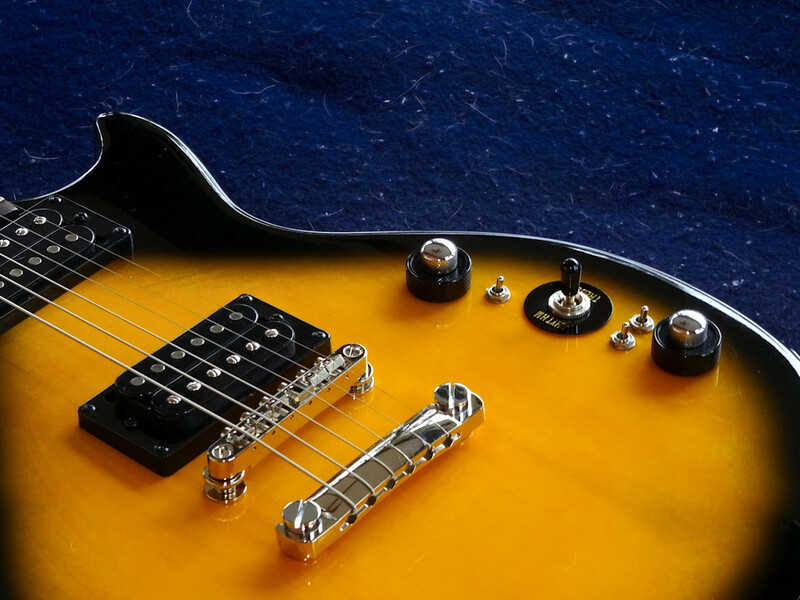 The higher-end Les Paul models don't appear to have that washer. So, I omitted it when I replaced the faceplate. Those two factors caused my 3-way to protrude further above the faceplate. So, at this point I installed the unused washer inside the cavity. That washer's so thin, I wrapped it twice in copper shield (that's two layers on each side of the washer). With the harness fully inserted: I soldered the 8 pigtails (that's two sets of green, red; black, white.). 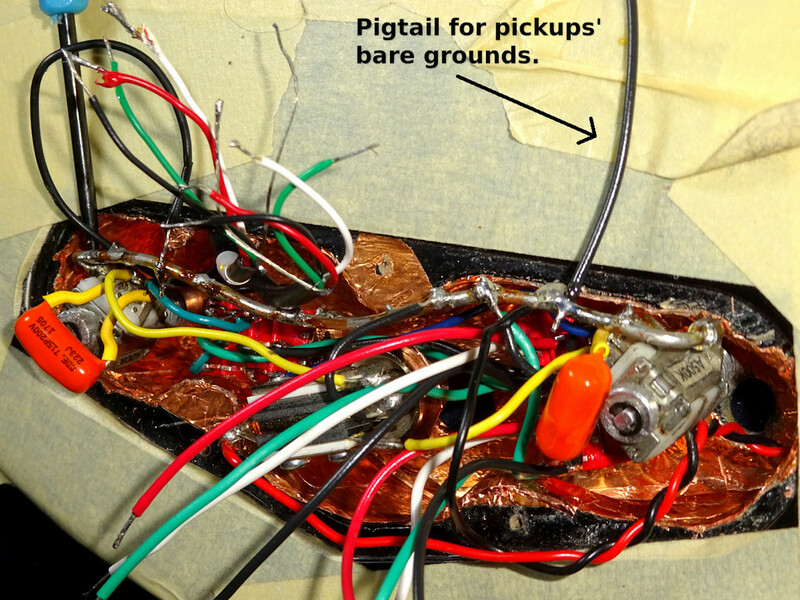 I also soldered the two bare pickup wires to the black pigtail (which I soldered to the ground bus while the harness was partially inserted). The solder joints are taped like a flag, not wrapped. This will be easier to remove when I work with the pickups again. The pigtails (3-1/2") might be a bit long. Instead of cutting, stripping and tinning those ends (again), I reduced the length of the pickup cables by pulling them back into their channel until only the unsheathed (colored) wires protrude. A little more Turtle Wax Express Shine, and "I'm ready for my close-up, Mr. DeMille:"
10.1. In step 4 (Positioning the switch), I drew the vertical line parallel with the tailpiece. If you look at the photos in that step, you can see that line isn't perfectly square with the horizontal line between the control holes. 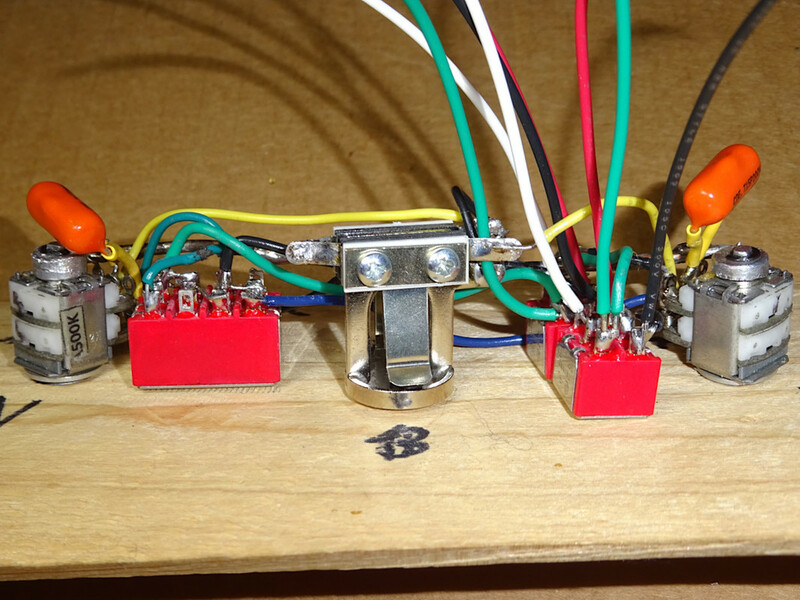 @Norton caused me to consider replacing the two coil switches with Seymour Duncan "Triple Shot" rings. 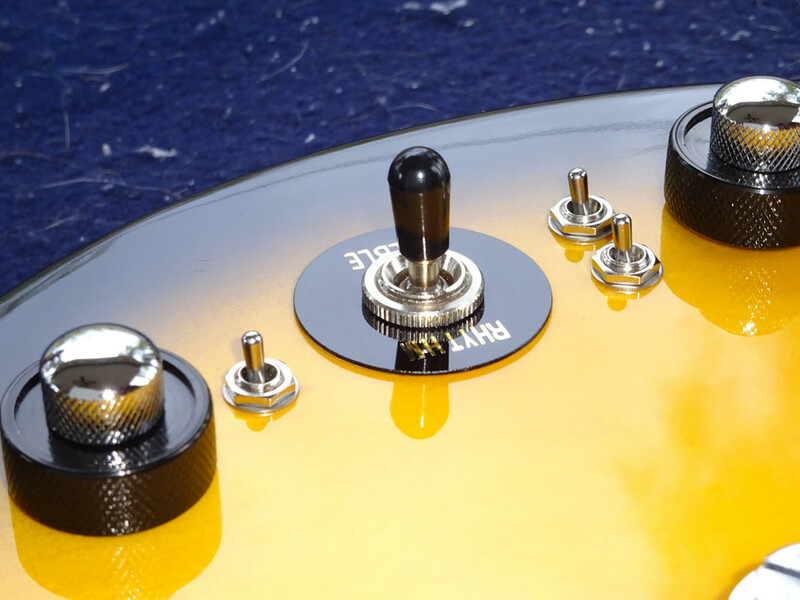 Then I could convert this mod's two toggles into switchable modern & 50s tone; independently controlling each pickup. (I would use two-position 3PDT (on-on) switches. Ex. Taiway #100-3P1-T200B1M1QE.). I don't plan to do that soon. 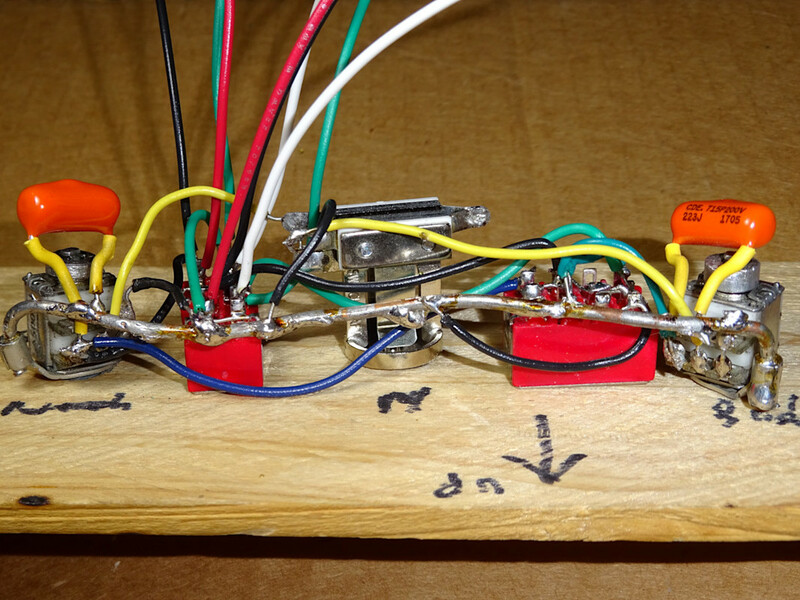 But, I'll diagram it (posted as Wiring mod #3, two posts down) in case anyone wants to see what that looks like. Maybe summit before me? The "Triple Shot" adds the ability to choose which coil is active. The south/screw coil is said to be brighter than the north/stud coil, especially in the bridge position. Being able to switch those would be useful. I think that would be even more useful if/when I experiment with "hybrid" (mixed coils) humbuckers (see 4-conductor mod, post #1, footnote 3). 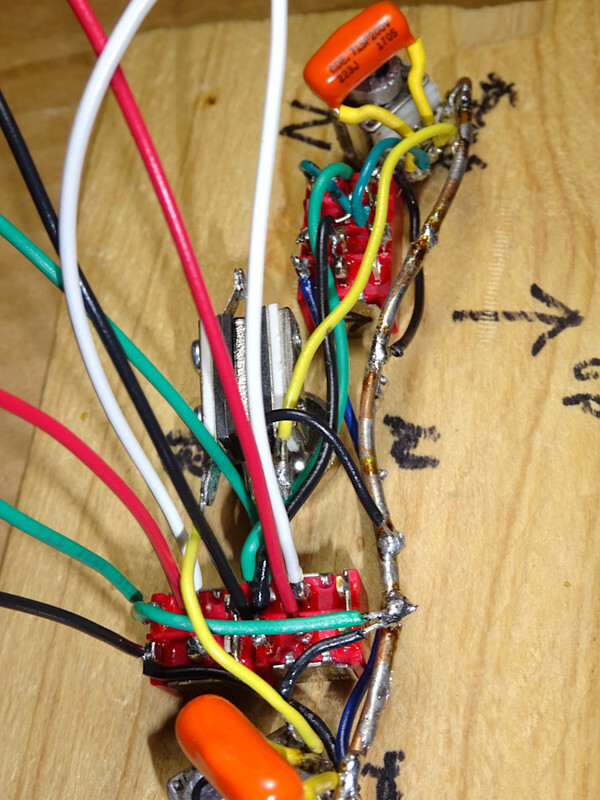 It would also be useful to not have the red/white wires go to the control cavity. Four fewer folded wires there would be good. Negatives (IMO): Coil switching won't be as easy to do as having switches at the controls. It's easier to experiment at the controls (rotate tone or volume knobs; "click, click, click" listening to differences.). I saw a "Triple Shot" wire diagram. If I understood correctly: I think it would be more intuitive to have the neck pickup's ring (just the ring, not the pickup) oriented with the switches on the bottom. (The bridge pickup's switches would be on top). That doesn't sound intuitive. But, in that orientation, the switches would point to the coil that's active (when using either of the two "cut" settings). To me, it would be intuitive to have that visual connection to what the switch is doing. At the time of posting this, I'm not planning to do this mod. As mentioned at the end of the coil-switch mod (two posts above), I want to play with changing the pickup magnets. 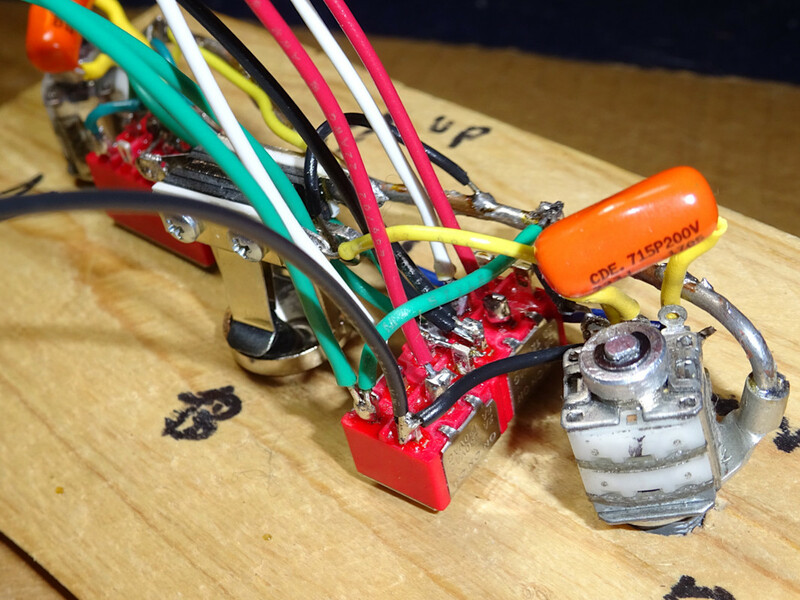 Also, add mini-connector "quick disconnects" inside the pickup cavity so I can play with the pickups more easily (without disturbing the control cavity). But, I would love to have 50's and modern tone wiring as a switchable choice. I like both those tones. That would be a lot of tone choice (on top of the other mods). I'm sure I'll eventually do this mod. 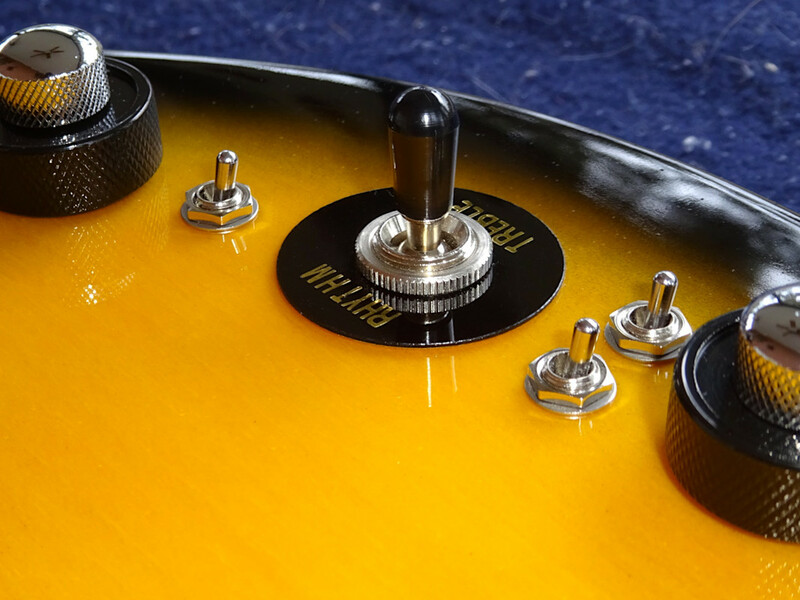 Replace the tuners with Grover Original 102 Rotomatics. Their shaft height is virtually the same as the stock tuners. (The tuner holes will need to be reamed larger. Remember: don't try to use a drill.). I don't advocate spending a lot of money upgrading parts. It will always be a Special-II. Such money could be used to buy a higher-quality better guitar (made with better wood?). But, with the work I've done, I think a small monetary upgrade would fit. However, I like the factory tuners. I feel no need to replace them. I removed mine, tightened the screw in the center of the gear. (You can tighten that very tight without damage). I brushed a light coat of silicone (SuperLube) grease to the cogs. I also tightened the screw at the end of the knob. (Don't overtighten that. You can squish a small washer out from between the stacked items on that knob shaft.). I think it's the guitar's nut that makes everyone think the tuners are worse than they are. My strings bind in the nut. I added graphite and it helped. Try the GuitarFetish "XGP SOLID BRASS" bridge. It's odd, and I've heard good things about it. A TusqXL nut (I don't know if I'd do that myself. After as much work as I've put into the guitar, I'd hate to wreck it removing the nut.). Sometimes I think my bridge is adjusted a bit too high. I'd like to try a neck-pocket shim to angle the neck further back (for a lower bridge). Stewmac makes a full-length shim. Using a piece of plastic (creating a ledge under the neck) can cause the neck to deform at the heel. I think it has to be a real shim. How are you going to be able to keep all this straight? I mean. I put a 6 position freeway on a triple pickup firebird and it’s hard to keep 6 options straight. Being separated seems easier to keep track of. So far it doesn't seem bad to look at the switches and see they're humbuckers out of phase, neck coils cut, bridge coils in series. I thought the same thing about the rotary switch (suggested earlier in this thread). The way the various options aggregated on one switch seemed like it would be hard to remember. But, with separate switches, it doesn't seem bad. Each one is it's own visual indicator. The diagrams were mind-boggling to me. I had a hard time keeping the various permutations straight. Fortunately, I had to wait 2-3 months for the "Al King tone" 4PDT (on-on-on) switch. During that time organized how I would document the mods, create the diagrams in advance. I think the "Triple Shot" switches will require a little more mental decoding. If I wasn't craving switchable 50s/modern tone I probably wouldn't consider the "Triple Shot." I think I like the toggles better. (But, I understand your original point that drilling holes isn't for everyone. And, it does give better "cut" options. I might like that at some point.). To me this is just a way to learn things on a guitar meant for learning. I'm not suggesting these mods are good for higher-end guitars. I think it's fun pushing the envelope with a guitar I'm not stressed out about. I've learned a lot I wouldn't have if I bought an upgraded model. I think I was motivated by the "chicken/egg" quandary. I would have gladly spent $600 on a higher-end guitar last July. But, I don't have an ear for tone. I wouldn't appreciate a $300 LP over a $1200 (at the store). Buying a "better" guitar would have been like flipping a coin. Then I'd be stuck with whatever tone that is (nervous modding it). Doing these things with a starter guitar gives me lots of exposure to common tone mods, how they affect (generally) a pickup, the direction the tones goes. I feel like it adds to the "learning experience." I'm not trying to create a high-end guitar. (But, it definitely has improved in sound quality.). Starting with a $99 used guitar, it's definitely been worth the money and time. I don't see what could be regrettable about it. (I've wasted $99 on far more pointless ambitions.). I'll end up with a better ear (to choose a higher-end guitar). And, skills I wouldn't have gotten from such a guitar. Sometimes I wish I would have bought the LP-100 or Studio-LT. I wish I had the standard 4-knob configuration & larger cavity (while still being in the realm of starter guitar). But, the dual-concentric mod was unusual and fun. I wouldn't have had the opportunity to do that. 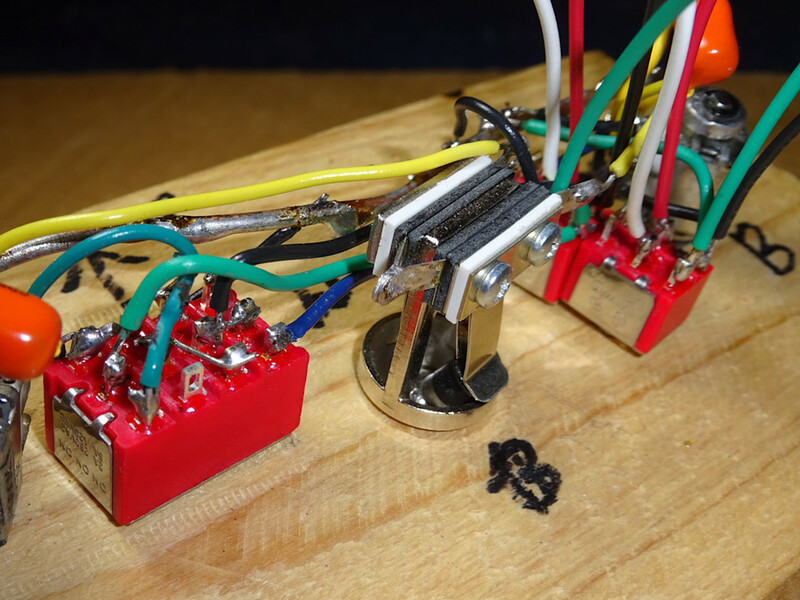 At the end ("next steps") of mod #2 (coil switches, six posts above), I said I'm considering putting "quick disconnects" on the pickup leads (inside the pickup cavities) to make it easier to mod the pickups. I looked further into this. 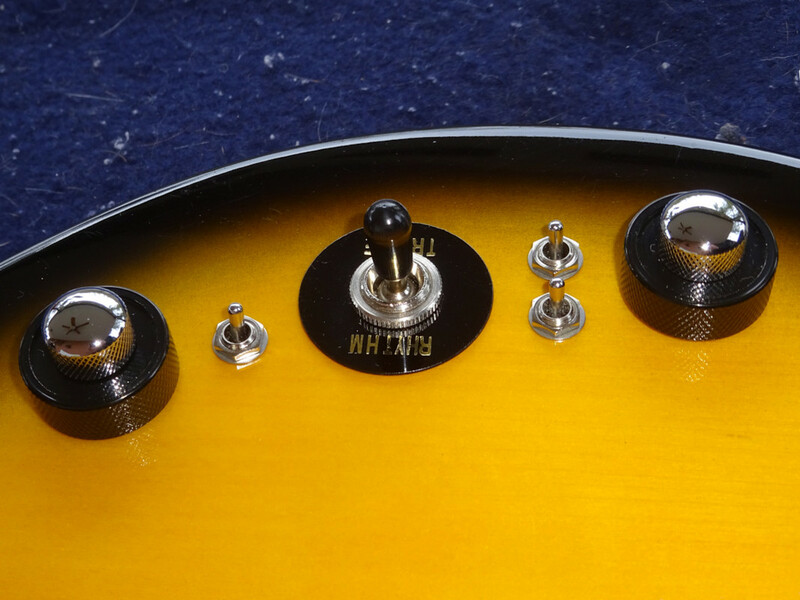 These appear to be the connectors used by Gibson. $22.45 @ digikey (Not required, but you might scrap connectors without it.). Those part numbers can be found on mouser.com too. Not counting the tools, it costs $1.76 to make a pair (male & female). That doesn't count shipping. But, if enough to make 10-25 were purchased, total cost go down. * There are Picoblade connectors on eBay. Male and female, with pigtails pre-wired. 4-pin, 6-pin. (3-pin & 8 pin.). But, no 5-pin. The 4- & 6-pins are selling for a reasonable $4-$6. But, when you go off eBay looking for the 5-pin, it only exists on guitar sites for $28. Maybe there's more sources I didn't see. But, that seemed odd. * The other odd thing: there's no other choices (in such small size). There's lots of other brands on eBay. Mainly JST SH (1.0mm pitch, the distance between pins). But, it's not made for wire-to-wire applications. (The female part is made to solder onto a circuit board.). There is another pair of male/female crimps for wire gauges 28-32 (50133-8100 & 50058-8000).